York Rotary Club have been running a Dragon Boat Challenge on the River Ouse for 14 years and raised over £940,000 for 170 York and Yorkshire charities. They expect that, with this year's event on July 9th, they will reach the £1000,000 mark! For the last fourteen years the Rotary Club of York has run an annual Dragon Boat Challenge on the River Ouse, on a course from Scarborough Bridge to Lendal Bridge. In that time they have raised in excess of £940,000 for York and Yorkshire charities and some 170 charities have benefitted from this event. This year, on Sunday July 9th for the 15th Challenge, the Rotary Club is confident that they will ‘Make it a Million’. Yes, a total of £1,000,000 devoted to good causes in Yorkshire! 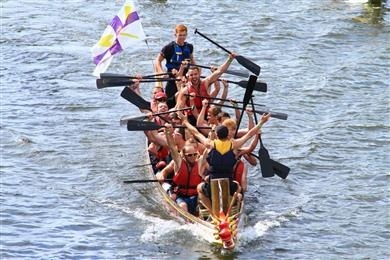 In 2003 the first dragon Boat Challenge was staged because the Rotary Club of York needed a new activity that had the potential to raise a decent sum of money to support the Rotary Club’s charitable objectives. They ‘poached’ the idea of a Dragon Boat event from the Rotary Club of Abingdon and were introduced to Dragon Boat Events Limited – (the company that continues to provide the boats and helmsmen, and manage river-safety) – who were immediately seized by the potential offered by the Ouse as it flows through the centre of York. A straight stretch of river, defined at each end by an iconic bridge, with plenty of space on either side, was ideal for an exciting, spectator-friendly sport such as Dragon Boat racing. Inevitably there were challenges to be overcome. Initially British Waterways were sceptical that three boats could be raced safely abreast down the river. Since 2004, four-boat racing has been the norm, with the Grand Finale featuring six boats – and British Waterways and its successor, the Canal and River Trust, have remained supportive! From the outset, York’s Civic Party have proved to be great supporters, turning up each year come rain or shine to meet and talk to the teams and participating charities - and there have been some very wet years! - In 2006 the then Lord Mayor, Janet Hopton, said, with great prescience; "This Rotary event has become in the last 4 years something that thousands of people enjoy as participants or spectators. It's success has encouraged the City Council to introduce the York Festival of the River which I'm sure will take off in the future". How right she was! The Civic Party’s support extends to them inviting the Rotary Club to use the Mansion House to host an Awards Presentation Evening each autumn. The City of York Council have also been instrumental in ensuring facilities are made available so that the event can run smoothly, and we cannot thank them enough. Also it would have been impossible to conceive of running an event such as this had it not been for the wholehearted partnership we enjoy with York City Rowing Club, learning from their experience of running regattas. A project of this size could not be undertaken without the help of local corporate sponsors. In 2017 the main sponsors are Shepherd Group, Joseph Rowntree Foundation, Saville Audio Visual, and William Birch and Sons. Their financial support helps ensure that all costs associated with running the Dragon Boat Challenge are paid for before participating teams start collecting their own sponsorship. This means that every penny raised by the 36 participating teams always goes to charity. Ever since that initial event in 2003, the basic format has remained the same. Teams, now numbering thirty-six, are drawn from local businesses, charities, and the armed services. For many, the day offers a great opportunity for team building. Each team selects a specific charity they wish to support, and two-thirds of the sponsorship they raise goes to that organisation. Every year either one or two charities are ‘nominated’ by the Rotary Club of York and these receive the other third of the sponsorship raised by all the competing teams. In 2017 the Nominated Charities are the Alzheimer’s Society and Macmillan Cancer Support. Although both are national charities, monies raised through the Dragon Boat Challenge will be spent on local projects – for Alzheimer’s on ‘Care Information’ and ‘Support’ programmes, and for Macmillan the provision in York of an Advance Care Planning programme. For many charities, the smaller ones in particular, the opportunity to take part in the Dragon Boat Challenge, has dramatically increased their profile in the City. One charity commented; “how much we enjoy and benefit from taking part in such a successful and well organised event.” Year on year teams re-apply to take part again, so the Dragon Boat Challenge is a nice mix of familiar faces and ‘first-timers’. Each of the participating teams competes in three heats, paddling against different competition each time. The six fastest teams then race off in a Grand Finale. There are several Awards for which they compete with trophies for the overall winner, fastest Armed Services team, fastest Charity team, best dressed team – they compete in fancy dress - and so on. The Challenge Trophy for the overall winner was designed and made by student Gavin Pollard through a successful design competition run by York College. 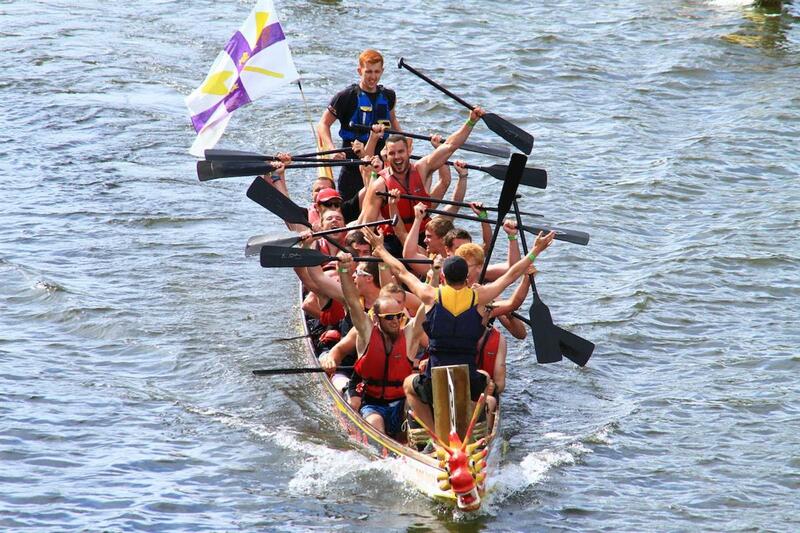 If you will pardon the pun, running the Dragon Boat Challenge hasn’t always been plain sailing. In 2012 the event had to be cancelled at two days notice owing to rising water levels. On the day scheduled to hold the event, the towpath and Rowing Club’s clubhouse were under water! But nothing daunted, the Rotary Club of York girded its collective loins and remounted the event six weeks later in September, when thirty-four teams still took part and raised a very sizeable sum for charity. Incidentally, two days after the September restaging, York Rowing Club’s clubhouse was once again under water! 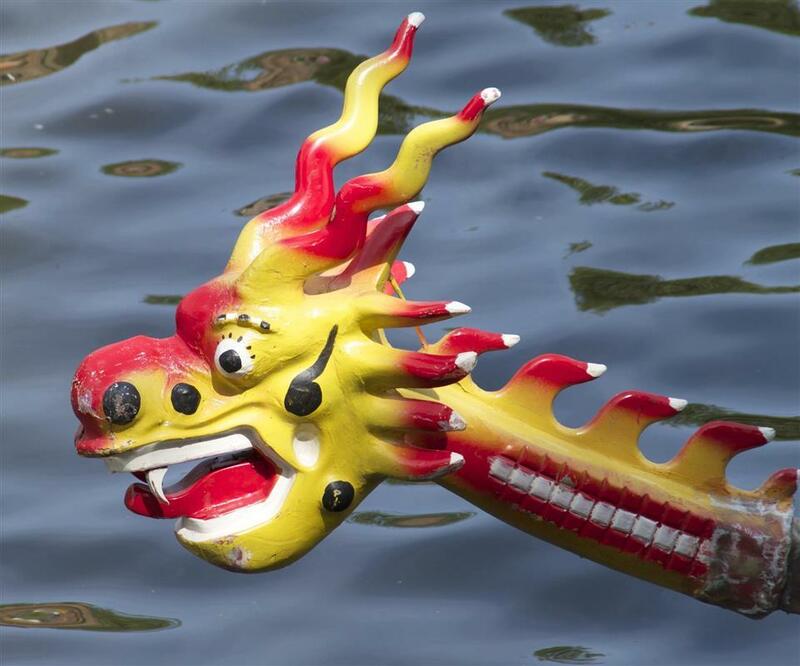 The Dragon Boat Challenge is a challenging but rewarding event to stage. The Rotary Club of York has a standing committee that concentrates solely on ensuring that each year’s event is better than the previous one. Interest in the event continues to be high, with more teams applying to take part than can be accommodated. Whilst this remains the case, the Rotary Club of York will carry on mounting the Dragon Boat Challenge. The 2017 Challenge will be run on Sunday July 9th on the River Ouse in the centre of York. Anyone intending to come along should make their way to the riverbank on the Museum Gardens side, where excellent views of the racing can be found. Where next after having ‘Made it a Million’? Why, try and get there again of course!